Beginning with NAKED SHAKES’ production of Shakespeare's classic Hamlet and ending with a multi-departmental production of The Hungry Woman by internationally recognized playwright and UCSB's own Cherríe Moraga, our 2018-19 season is brimming with life and innovation! Fall also brings Vanity Fair, a play by one of America’s most exciting young playwrights, Kate Hamill, as well as a Fall Dance Concert featuring choreography by our talented dance faculty and a re-staging of international choreographer Shen Wei’s RE-III. In the winter, Santa Barbara Dance Theater celebrates its 43rd season with an exciting array of premieres by guest artists Josh Manculich, Yusha-Marie Sorzano, and Doug Elkins Dance Company. The department’s own new play development program, LAUNCH PAD, will stage a brand new play The Watsons Go to Birmingham — 1963 based on the book of the same title by Christopher Paul Curtis and adapted by Cheryl L. West. Closing the winter quarter, we commemorate the 20th anniversary of the murder of young Matthew Shepard with Moisés Kaufman’s The Laramie Project. April ushers in our annual Spring Dance Concert, featuring the works of senior BFA choreographers and a new commissioned work by Doug Elkins, and May once again features the New Works Lab, featuring original student work. led by Daniel Stein, a BFA acting project of Chekhov’s The Cherry Orchard, and the return of Irwin Appel’s adaptation of Shakespeare’s history plays, The Death of Kings: Seize the Crown. It is with our deepest gratitude that we thank John and Jody Arnhold for their visionary support of the Department of Theater and Dance. In addition to the establishment of the John and Jody Arnhold Endowed Theater and Dance Production Fund, we are appreciative of an exceptional opportunity the Arnholds provide enabling our students to participate in the Dance Education Laboratory at the 92nd St Y in New York City. This year alone, we look forward to welcoming Doug Elkins, Monica Bill Barnes, Ephrat Asherie and Dorrance Dance for residencies through their support. John and Jody continue to lead the expansion of possibilities for our passionate and talented students, faculty, and staff who produce fresh, vigorous work both on and off stage. 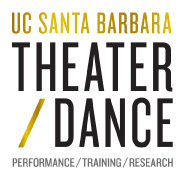 UCSB’s Department of Theater and Dance continues to thrive, and we thank all of our donors and friends for their dedication and invite you to join us and experience the excitement!